The Measure Tool is used to gain knowledge about pixel distances in your working image. 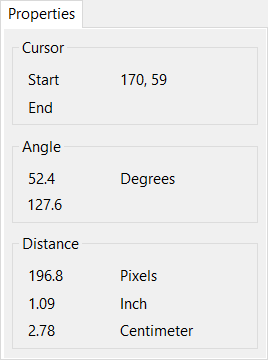 By clicking and holding the mouse button, you can determine the angle and number of pixels between the point of click and where the mouse pointer is located. The distance between the original point and the mouse pointer is displayed at the right side of the Image window. The measure unit is shown as Pixels, Inch, and Centimeter. 2. In order to measure the distance between two points, you need to draw a straight line segment. Click on the beginning point and drag the cursor to the end point. All information about the results of your measurements can be viewed in the information palette.